A candle warmer is a device that helps to disperse the scent of a candle without the use of an open flame. Candle warmers are often used in homes with kids or pets, as well as in public places where an open flame is not allowed due to safety concerns. 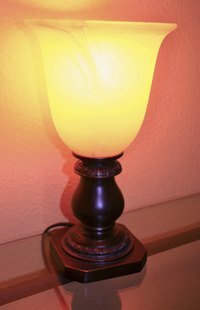 While there are several different types of candle warmers, many prefer to use a low-watt light bulb to warm the wax. These types of candle warmers are available for purchase in most specialty candle shops, but you can also make your own homemade version. Purchase a torchiere-style accent lamp or desk lamp. Replace the bulb that is in the lamp with a 20-watt bulb. This is necessary to prevent your candle warmer from becoming a fire hazard. Place a heat-resistant ceramic dish over the top of the torchiere shade. Many ceramic soap dishes are the right size for this project. Place your candle tart or wax cubes into the top of the warmer. Turn the lamp on and enjoy your fragrance. Different companies produce candle wax of varying quality. With the less expensive candle brands, you may need more wax in your homemade candle warmer in order to get the scent you desire. Pay attention to the length of the lamp cord so you have some place suitable to plug in your candle warmer. Consider using a colored light bulb to add an interesting ambiance to your homemade candle warmer. Using several different scents together is a fun way to create your own signature fragrance for a party or special occasion. Many people suggest making homemade candle warmers by using your coffee pot's warmer plate. However, this is considered to be a potential fire hazard. A coffee pot's warmer plate isn't regulated to maintain the consistent low temperature needed for melting candle wax. How Does an Electric Candle Warmer Work?